Get to know the vibrant city of Barcelona on a fascinating hop-on hop-off tour through the city. 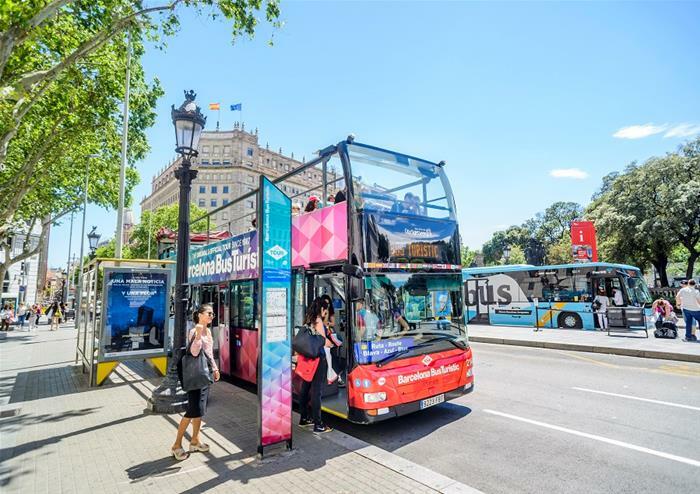 With a choice of one or two calendar days, you’ll get to hop-on and off as you please at Barcelona’s most iconic locations. See Gaudi’s most famous artworks at the exquisite Sagrada Familia and Casa Mila, with architecture that is sure to take your breath away. Better still, you can take in Gaudi’s finest work at Gràcia, Park Güell, and Palau Reial. Hop off at the historic Gothic Quarter, reminiscent of its Roman past where you will get to explore this stunning area with its rows of delicious restaurants and bustling bars. Discover Poble Espanyol, Museu Nacional d’Art de Catalunya, Fundació Joan Miró, Colom – Museu Marítim, and Museu d'Història de Catalunya. If you’re looking for fashion, this is the place for you to shop until you drop – right next to where you can hop back on the bus tour! For all of the football fanatics, you can hop off right outside the world’s most famous club – Futbol Club Barcelona! Dropping you off at the gates to the stadium, you can choose to explore La Liga’s number one club and their hugely successful history with the stadium and museum tour.